I went completely makeup free for my wedding. Here are some reasons why! Tears. I did cry during my vows, and didn't have to worry a bit about my face. If you cry at your wedding, you don't have to worry about messing up your makeup! I was able to schedule less time to get ready for the big day! This really helped ease my stress, since B and I married at 10am. No makeup smudges on my dress, hair or other accessories. 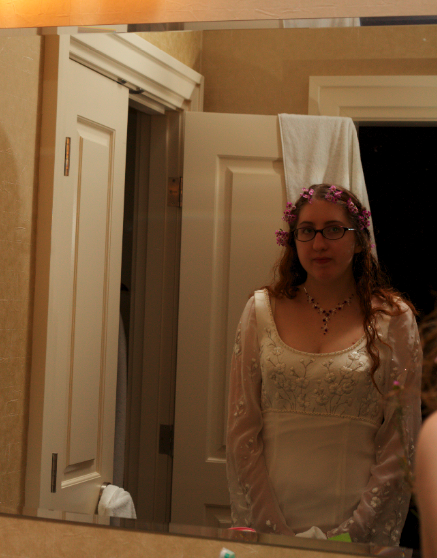 When the groom romantically carried me into the wedding chamber, I didn't need to run to the bathroom to remove anything from my face. I stayed in bed all night, and had a wonderful fresh face the next morning instead of any icky day-old makeup! I didn't have to carry around any touch-up makeup in a bag or purse. Less to hold on to throughout the day, (or less for my maid of honor to carry, actually). Easy packing. Forget makeup? Who cares, I don't wear it anyway! Just one less thing to remember. What about you? Would you ever go makeup free for a wedding or other special event? I'm basically makeup free 24/7, so it was an easy choice for me! Did God Kill My Babies?